Hello everyone! As you probably know, several of us here at EV Studio have been very involved in the organization of this year’s Natural Talent Design Competition. I just wanted to remind you all about the Awards Event for the competition which will occur a week from today on Thursday August 7th, 2008 from 5:30 – 8pm at the Wynkoop Brewery in LoDo! Our five finalist teams will be presenting their projects along with a presentation on sustainability in the Urban Fabric of LoDo and a Keynote Speaker. The prizes will be awarded following the presentations at the event and there will be food, drinks and networking opportunities as well!!! Tickets are $20 in advance or $25 at the door and include the first drink. There are USGBC Member and Student discounts available as well. 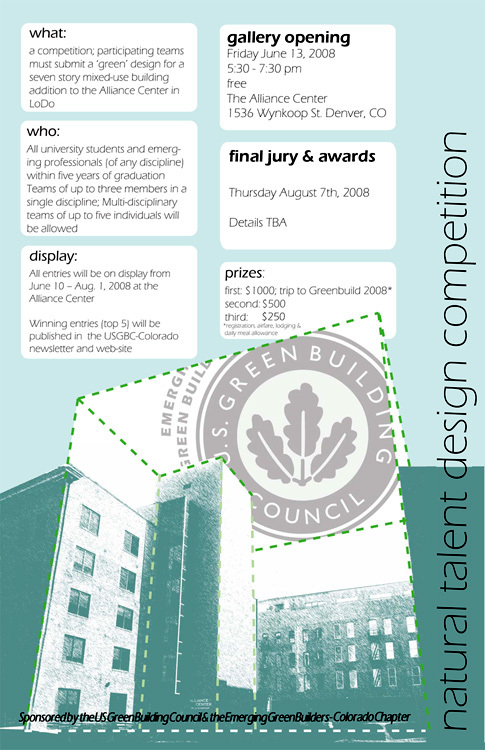 The Natural Talent Design Competition is a national design competition that is organized through the Emerging Green Builders arm of the U.S. Green Building Council. Each local chapter organizes the local competition including a local project and chooses a winner that is then sent to compete nationally at the Greenbuild Convention in November. The competition provides an applied learning experience to emerging professionals to gain experience with integrated design, sustainability and innovation. This year’s project is a seven story addition to The Alliance Center which is a Multi-tenant Non-profit center currently housing 30 non-profit groups and providing the spaces and services that encourage collaboration and communication between those organizations. Entries to the competition will showcase the latest cutting-edge sustainable technologies and principles, and must consider the design’s impact on the surrounding revitalized urban historic district and the property’s existing historic building. The projects utilize the latest ideas and innovations in sustainable design and strive for measures of sustainability. I encourage all of you to attend the event and support the talents of our emerging professionals and sustainable design in Colorado. We have invited the press and would like to extend this invitation to any members of the press who are interested in the event. We are also seeking corporate sponsorships for the event. Please contact Elicia if interested in sponsorship to discuss the benefits of corporate sponsorship and so that participation in the event can be arranged prior to the event. Thank you all for your interest and support and I hope to see you all at this great event! The Congress for the New Urbanism Colorado Chapter Organizing Committee announces a tour of The South Main Neighborhood in Buena Vista, Colorado. The tour will take place on August 2, 2008 with a tour at 11:00AM, lunch at 12:30PM and a slide show at 1:30PM. 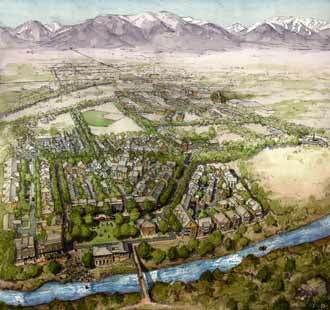 The South Main Neighborhood was designed by Dover, Kohl and Partners to extend historic downtown Buena Vista to the Arkansas River, site of a whitewater park for kayaking, rafting, fishing, hiking and biking. More than two acres of river corridor was donated to the town as a permanent public park, and Katie Selby Urban, co-founder of South Main, wrote and coordinated a grant with Great Outdoors Colorado and fundraised in the community to fund the whitewater park. The property was once used as a trash dump, and pre-construction clean-up was extensive. The project began with a week-long public charrette process, which helped South Main garner a high level of community support. Co-founders and siblings, Jed and Katie (both in their 20’s at the time) led the project, their first, through the entitlement process, which was complete in one year. After another year of work on infrastructure and architectural reviews, vertical construction began in January 2007. Currently there are 21 homes and businesses under construction. All homes are required to be certified through Built Green Colorado. The architectural review process, which was initially extensive due to the custom nature of all the homes. Such significant activity in a town of 2500 has sparked many conversations on land use and zoning and has helped influence smart growth in Chaffee County. Sean and Dean have submitted several articles to the Electronic Magazine site, Ezine Articles for publishing. They’re similar to the blog posts but have a few tweaks to make them work for a wider audience. The next piece that we talk about is the exterior design of your house and the form and massing of the design. The discussion of style is quite a long one, so at some point I’ll write a more thorough style post. For now let’s talk about what I need from you. Please keep in mind that we can help with all of these decisions, so don’t get overwhelmed. First off, what style do you like? What is it about that style that you do like and what don’t you like? If you aren’t clear on a style, bring or email some images of houses that you like and anything that you’d like to avoid. If you’re more concerned with fitting into a neighborhood, bring in some images of the existing neighbors. Besides the style, what sort of exterior materials would you like to have? Is brick or stone more appropriate? Would you like real stone or fake stone, round stone or stacked ledgestone, patterned brick or common bond? 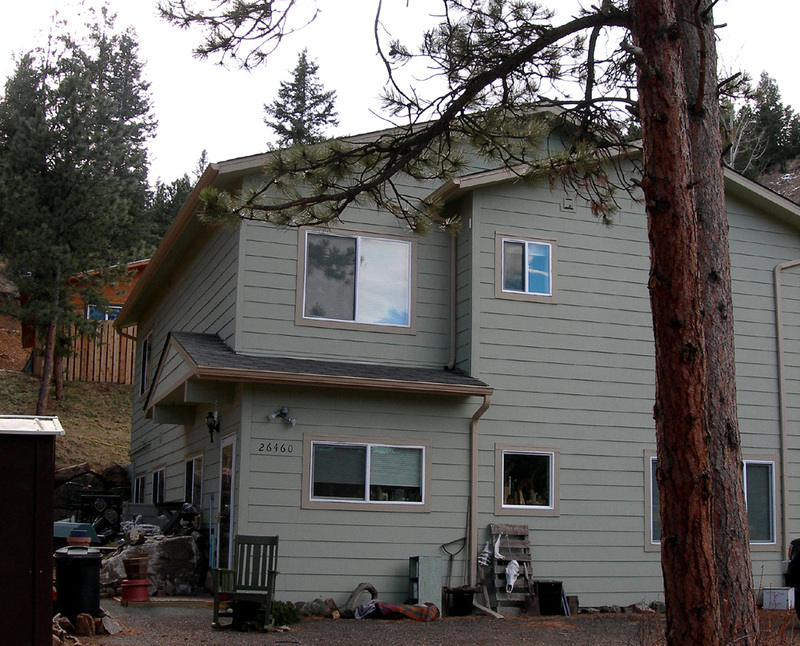 Would you prefer siding or stucco? What is the siding made of and what is the pattern? Have you considered a metal siding product or maybe a glass wall if that’s appropriate? Is the house going to be made out of a material like log where the skin is also the structure? Round log or square log? How much window do you want? Are you looking for views or light or a combination? Do you prefer casement, slider, single hung, double hung or fixed styles? There are quite a few choices in roofing. Are you looking for simple asphalt shingles, or something else like tile, metal, slate or even copper? If you’re considering a flat roof there are a number of options especially if you plan to have a walkable roof. Next up, we’ll discuss your home’s structural choices. 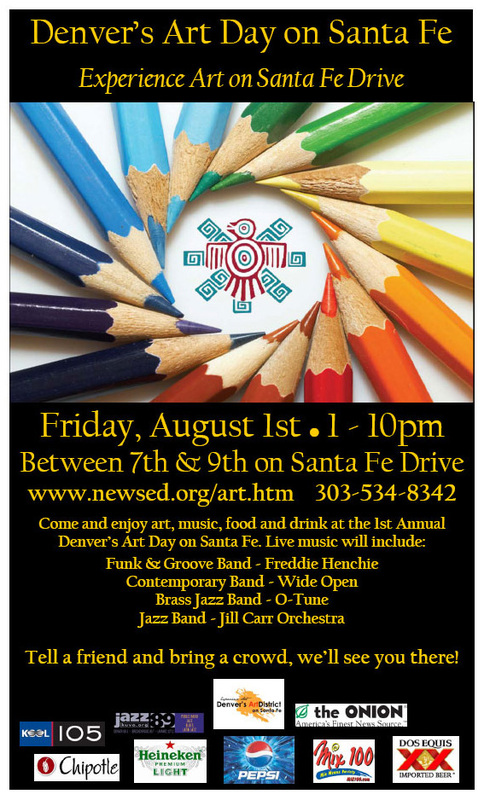 This Friday is Denver’s Art Day on Santa Fe and our Denver office is right in the middle! Come by for the entertainment and feel free to drop in and say hey to EVstudio. Affordable housing is a specialty of EVstudio and an area that we plan to be very involved in. We are currently working with Mercy Housing Colorado on the Holly Park Community Center in Commerce City. This building will serve the residents of an existing affordable housing complex that is lacking community facilities. In addition we will be doing unit renovations at Holly Park after the completion of the Community Center. 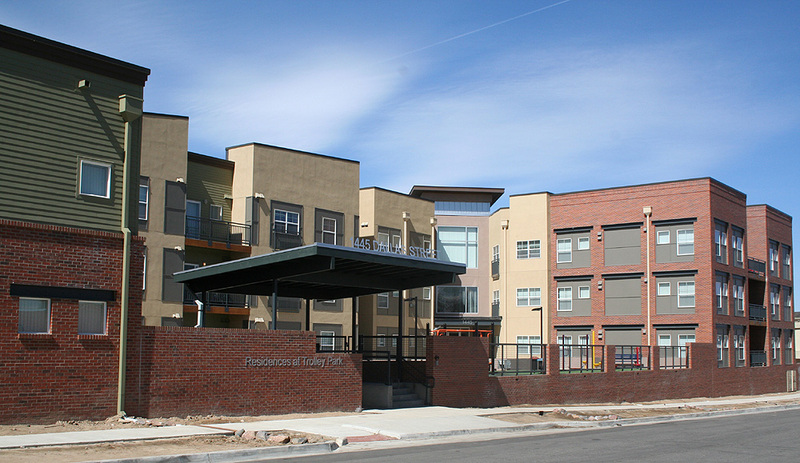 We have several other multifamily projects currently in design including a 12 unit renovation with 9 new units in Denver and a triplex in Frisco. 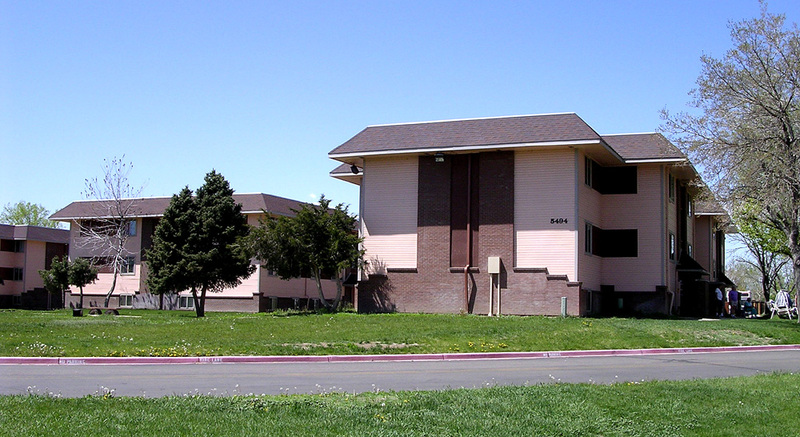 We acted as a subcontractor to do the as built drawings for a major remodel of 160 units at the Overlook at Thornton. Prior to founding EVstudio I worked for Odell Architects, PC for three years doing primarily affordable housing. I was heavily involved in projects including a 38 unit building over structured parking in Aurora, a 92 unit complex in Grand Junction and a 60 unit senior housing building in Englewood. At a smaller scale I led a volunteer effort to design a house for Blue Spruce Habitat for Humanity. In addition to our experience in affordable housing architecture, we also use my wife, Stephanie O’Hara as a resource. Steph worked as a grants specialist and a planner analyst for Jefferson County’s Community Development Department which gives us an extra view point. You are currently browsing the EVstudio Architecture, Engineering & Planning | Blog | Denver & Evergreen | Colorado & Texas Architect blog archives for July, 2008.